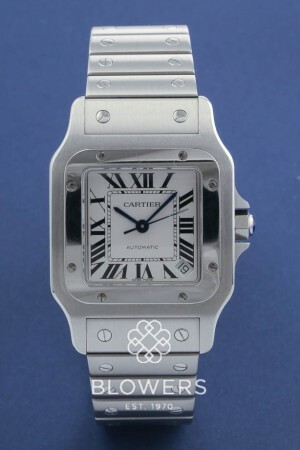 Cartier Santos Galbee W20098D6. Automatic movement. Water resistant to 30 meters. Steel case width 32mm, 35mm with crown. Silver dial with Roman numeral markers, blued hands and date window between the 4 and 5 position. Steel bracelet with double folding concealed clasp. Box and papers dated January 2015. SKU: 3088030. Categories: Cartier, Santos.